Not everyone enjoys keeping a journal or diary, but some people truly enjoy keeping records and writing things down in this way. Whether or not this is something you actually participate in, each person’s personal records would say something completely unique to them. 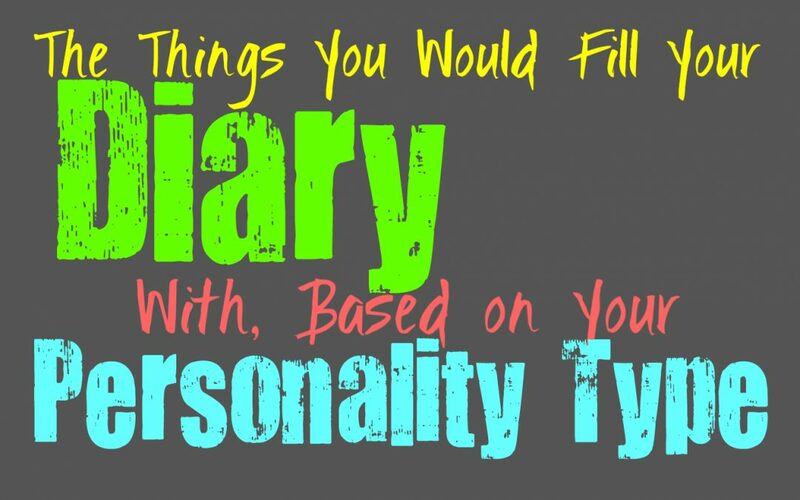 Here are the things you would most likely fill your diary or journal with, based on your personality type. INFJs often enjoy writing out their thoughts and feelings, and might even feel like they can process them better this way. The INFJs diary would likely be filled with a little bit of everything, from their dreams all the way to their darkest emotions. They would fill it with their happiest feelings, and some of the darker and more upsetting things they experience. INFJs are complex people with darker thoughts, and yet truly hopeful and complex emotions. They would like fill this diary with all of those things, and even some silly thoughts or positive things about their loved ones. The ENFJs diary would likely be filled with many things, from their hopes and dream all the way to the lists of what they want to achieve. ENFJs often have a lot of goals in life, and so they might want to write these things out to help them process their thoughts and emotions about them. ENFJs would also fill their diaries with what they experienced and how those things made them feel. While ENFJs think a lot about their loved ones, their diary would also have plenty of their own internal thoughts and feelings. Their diary would be like a chance to really express what they want, which is something ENFJs don’t often get in life. The INFPs diary would likely be filled with many different things, ranging from their thoughts and feelings, all the way to their darkest of secrets. INFPs have so much going on inside of their hearts and minds, and so they might even enjoy having a place to record all of this. INFPs might even like using their diary as a place to write about their imaginative thoughts, maybe even stories they come up with. Their diary would likely be filled with many different things, possibly without a complete direction that others would find organized. ENFPs would likely keep a lot of different things in their diary, including thoughts, feelings, ideas and even things that they wouldn’t share with others. ENFPs have rich imaginations and for them their diary would likely be the place they could unload everything without a feeling of guilt or shame. They would put their happiest moments, and even their darkest secrets and thoughts. ENFPs might even enjoy writing out their more imaginative thoughts and ideas that might seem a bit crazy to others. INTJs are complex people with a lot more going on than people realize. While their diary would likely be more of a journal, filled with information and ideas, there would be plenty of other things in there as well. INTJs also have a creative side, and so their diary might be a good place to unload those deeper and more unexpected pieces. They might enjoy writing out things in a way that would be deemed poetic to others, and this would be a great place for a creative outlet. INTJs are logical and factual people, but they also have rich imaginations. The diary of the ENTJ would likely be more of a journal, filled with so many different thoughts and ideas. They would enjoy writing things out in a way the helps them process their thoughts and even their feelings. ENTJs often have so much going on inside of their minds, and so having a place to record everything could be truly useful for them. Their diary would be filled with the ENTJ dreams, ideas, and even their accomplishments. They might even include some more creative things, and would enjoy having a place to unload this. INTPs would definitely benefit from having a diary, or any place where they could write out all of their thoughts, feelings and ideas. INTPs have so much going on inside of their minds and so sometimes writing things out can be a great way for them to process all of this. For the INTP it is also a better way for them to express things or convey a point to someone else that would others become jumbled. Their diary would likely be filled with so many random things, including thoughts, new ideas, desires, and even a way for them to get a bit creative and tell a story or two. ENTPs have so much going on inside of their minds, and this would often show up in their diary or journal. This would be a place for them to fill with their thoughts, ideas, feelings and even creativity. ENTPs have a lot to say, and sometimes being able to write all of this out would be truly beneficial for them. It would be a way for them to process their feelings and thoughts, and really uncover the patterns that they aren’t seeing as clearly. The ENTPs diary would be a combination of facts and science, as well as feelings and depth. The ISTJs diary would likely be filled with their thoughts and daily achievements. It would be a place for them to put all of their frustrations and concerns, as well as the things they are happy about. ISTJs often need a place to vent but most of the time they keep things to themselves. Their diary would be the perfect place to unload all of these thoughts, and keep it from making them feel guilty sharing it with others. ISTJs might even fill their diary with things they want for the future, as a way to remind themselves of these important things. ESTJs would often keep a lot information and ideas in their diary, and would fill it with things they might find useful. ESTJs also have a lot of pressure on them to perform in life, and so their diary might be a place where they fill their frustrations. ESTJs are likely to enjoy using a diary as a means of venting and getting out all of the thoughts and feelings that are overwhelming them the most. ESTJs have a lot inside of their minds but having a place to get this all out would be useful for them. ISFJs would likely fill their diary with their daily thoughts and feelings, and might enjoy having a place to vent sometimes. Their diary would likely have everything they experienced that day, and their response to all of it. ISFJs might even discuss their deeper emotions, the ones they are afraid to openly share with others. ISFJs often have a hard time exposing their feelings to others, since this can feel like they are burdening them. Their diary would be the perfect place for them to let everything out, without feeling bad about it. The ESFJs diary would likely be filled with their daily thoughts and feelings, and what is plaguing them most. They often have a hard time sharing their feelings with others, especially the things that hurt them the most. ESFJs don’t want to burden others with the things that are bothering them, and so they keep it all inside. Their diary would be the most perfect place for the ESFJ to vent and really express the emotions they often keep inside. ISTPs would likely fill their diary with the millionths of thoughts and ideas running through their minds. They have so many things they need to process and so it might be useful to have somewhere they can unload this. ISTPs might use their diary as more of a place to record their thoughts and the things they want to achieve. They aren’t often the type of people to keep a record of things for a long time, and would likely lose interest after a while. For them a diary would be a useful place to let out their thoughts and possible even the feelings they keep buried inside. For the ESTP their diary would likely become a place for bother thoughts and emotions. Most people would expect ESTPs to be completely factual, but they have a depth of emotions that they often have a hard time expressing to others. They want to be able to let these feelings out, but they struggle when it comes to processing them. For the ESTP their diary would be a great place to unload those feelings and really make a clearer sense of them. The ISFPs diary would likely be filled with everything, including their feelings, thoughts and even the smaller things they experienced that day. For them a diary is a perfect place to really unload everything, even the pieces they don’t want to share with others. While their diary would be filled with sincerity, it might also include ideas they aren’t entire sure they believe in. ISFPs might even use their diary as a creative outlet, or a place to be more poetic and descriptive. ESFPs are often more focused on living life than writing about, but that doesn’t mean their diary might not be a useful place for them to vent. For the ESFP their diary would likely include their thoughts and feelings from that day, and would be a great way to really process all of it. They have such deep emotions and sometimes it can be hard for them to feel like they have fully expressed them to others. Their diary would be the place they could go to just vent and let it all out in a way that others might not completely understand.